Understanding and selection of social platforms are essential for planning and executing your event’s social media marketing goals. In a previous blog we shared some stats and details about the “Most Effective Social Networking Site for Event Presenters”. In this blog, we will share some stats and details about how event presenters perceive certain social media platforms. In a survey conducted by SocialMedia Examiner, event presenters having more than 5 years’ were presented with 8 social media categories and asked them to rank them in terms of least used to promote their events. It turns out that the vast majority of event presenters don’t believe in social bookmarking and Q & A websites as vehicles for promoting their events. Alternatively, no presenter was of the opinion that social networking sites have little use, and very few were of the opinion that image sharing and video sharing have little use for promoting their events. 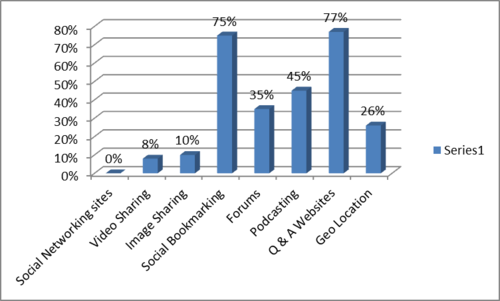 While forums and geo location may not be as popular, they nevertheless seem to have importance to a majority of presenters. This is not necessarily to say that you should ignore social bookmarking and Q & A websites. It could be that these are valuable platforms that are being grossly under-utilized for promoting events. However, there is clear consensus among presenters that social networks, video sharing, and image sharing carry a great deal of weight, which is why Yapsody’s Facebook and Twitter sharing features allow you to easily keep your fans and followers informed about all your upcoming events.